High Five Events of Austin has purchased Conley Sports from John and Stacey Conley, the long-time owners and producer of the Austin Marathon. High Five is owned and operated by Dan Carroll and Jack Murray and Stacy Keese, Murray’s wife and business partner. 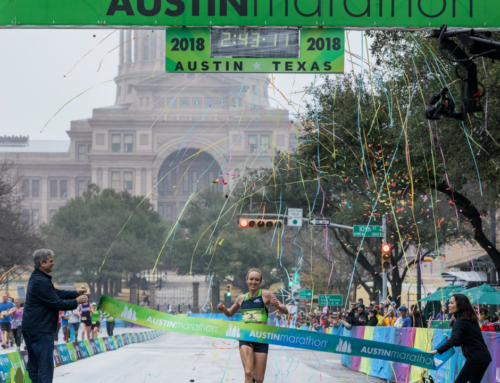 Terms of the purchase price have not been released, but High Five Events has long had its eye on the Austin Marathon as have other race production businesses. Murray is the co-founder of Jack & Adams Bikes – now Bicycle World – and was named the president of parent company Texas Endurance Sports in March. TES owns and operates the five Bicycle World stores in Texas. Carroll runs and co-owns High Five along with Keese who also manages High Five and owns Skeese Greets, a women’s triathlon. High Five Events is the multi-event spin off of Jack & Adam’s and has been in business since 2006. It has produced the entire Texas Tri Series, including the Rookie, the Couples, Jack’s Generic and Tri Rock Austin as well as the several duathlons and the Manzano Mile. It has also taken over race management of the Statesman Capital 10,000, the car2go Marathon Relay and Ironman 70.3 Austin as well as several other high profile events. Conley Sports has been in business for nine years. Prior to that, Conley worked for RunTex in the race management end of that business, primarily on the marathon as it transitioned from the Motorola Marathon to Freescale to AT&T to Livestrong and now, finally back to the Austin Marathon. This is year two of Freescale Semiconductor as presenting sponsor but by the end of the year they will merge with NXP – a tech company out of the Netherlands. John Conley has been race director of the marathon for 19 years.